Apparently, the external system drives the CPU by sending an intermittent ascending ramp voltage over the single wire. The charge enters both a ground storage capacitor and a power capacitor. When the voltage ramp reaches a certain threshold, a FET turns off, isolating the ground storage capacitor. The power capacitor continues to charge until there is enough potential difference between the two capacitors to operate the circuitry (see chart, right). The ramp then goes to zero which allows the CPU or the external system to communicate during the time before the next ramp begins. 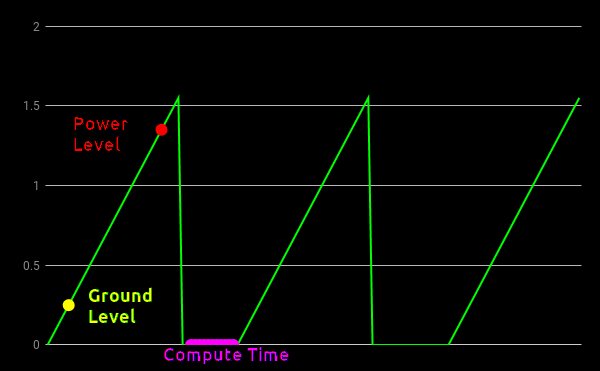 [Lipfir] continues, “The great thing is that the ramp sets the clock speed and with one wire, you can connect as many CPUs together as you need. This really simplifies board layout and cuts down on traditional ground plane issues.” Of course, adding too many processors to the same line will make programming more difficult. A company insider mentioned that as a homage to the Dallas tradition, they had considered naming the devices “0-wire.” However, they decided against it as it would conflict with the company’s upcoming line of true zero wire devices, due out about this same time next year. I like the ground capacitor!! i thought it was management speak for the two ends of a single capacitor until i looked at my calendar. it seems like a very plausible product to me. Add some spices to disguise the taste and it’s pretty good. Just waiting for real people to actually build this. The new HaD tradition should be un-jokifying april fools pranks by making them actually work somehow. Is there a lawyer in the house? Somebody incorporate Cyclopia and draw up the patents. We have a year to get this done. Needed, one crashed alien spaceship. In all seriousness, this isn’t much beyond what I saw many years ago, at an air traffic control RADAR site. The RADAR system was housed in a box about the size of a 20-ft trailer, sitting maybe a quarter mile from the runway at an Air Force base. The surprising thing about it, was that the only thing that connected it with the control tower was a piece of RG-8 coax. This supplied both power and synchronizing signals from the tower, where the power supply was, and in return, RADAR video back to the tower, where the display ‘scopes were. Have you not seen coax? It’s just one. Why would it be “coax” if it were just one wire? How would it be round if it was two wires? I think you need to understand the difference between “wire” and “cable”. In coax there are usualy TWO conductors in coaxial arangement, one of them works as shield. Hence the name coax. A coax cable is two conductors, the centre core and the shield. One wire with multiple layers then. With a cocococoaxial cable you could run power, ground, and full-duplex data. If a shield was a conductor then Captain America wouldn’t be able to fight in a thunderstorm. Definitely one. I haven’t seen Captain America and Odin together, so maybe it is conductive. Does the shield not conduct electricity? It’s many wires. A fat one in the middle and a bunch of little ones around it. Any sizeable radar system probably has an integrated power generator. I doubt a single RG-8 coax could supply enough kilowatts to keep a radar system running without turning into smoke. This is a real thing. This is a RADAR to cover the 20 miles or so around an airport. Not that much power. I’m sceptical about that too. I would expect that such a RADAR would be in the kW power range which would be pushing it for an RG8. The other thing is that I’m surprised there is no redundancy, if your link is cut you loose the whole system. Well, we’re solidly into April 2 now, and still I say, I’m serious. What you may not understand is how much power is necessary for pulsed RADAR. I worked on long-range systems that operated with 2-5 megawatt pulses. That’s PEAK power. Due to the very low duty cycle (you send out a pulse of a few microseconds, you wait several MILLIseconds for the returns, for duty cycles in the 10^-3 range), the average power needed is low. The 250-mile systems I worked on used average powers of less than 10 kW For a 20-mile system at an airport, used only for controlling aircraift on approach and departure, keeping in mind the square-law power requirement for transmitted power, the average power is in the TENS of watts. I’ve seen RG-8 used for hundreds of watts. I think this was release in Australia a day before it was in the US. april fools day truly is the most cancerous day of the year. Agreed, I’ll always scrooge on this awful holiday. The internet is already packed to bursting with dumb jokes, ugh. Amazing what technology we can use this day! Pffft, I have several zero-wire chips in my pocket already. I’m waiting for that future technology called -1wire. Sorry, I missed the Minus sign! Back in the 60’s and 70’s there used to be a company called poly packs that sold surplus parts in little poly packs. If you got one of their floor sweepings packs you always got a few 1 terminal diodes that the big companies tried to keep secret. These were known as monodes. I have seen switching monodes, small and large signal monodes, zener monodes and of of course, early versions of LEM’s, light emitting monodes. And let’s not even get into the various types of binisters…. Nah, Al would never stoop so low. I was just thinking the exact same thing concerning RFID. Technically speaking I don’t think this is impossible; it’s just not practical. There’s a special place in hell for people who explain other peoples jokes. Explain ? Examine the tags and the bottom of the article, just above the comments. ?? Methinks you missed my point. There’s a special place in hell for people who say ‘methinks’ as well. Now that is really funn….!! Are thermals recommended for the through hole part, or does the added impedance adversely affect data rates? Not as impressive as the pin less mcu from fubar elec that has a nuclear reactor onboard for power and communicates through telepathy with the other components on your pcb. Sounds like what Nicolas Tesla was working on at Wardenclyff. It works because they employ Maxwell’s Demons (https://en.wikipedia.org/wiki/Maxwell%27s_demon) on the FET gates. This, of course, caused a huge spike in Maxwell’s Demon futures. I never really got Maxwell’s demon. I’s just a really, really slow heat pump. Of course you can violate the laws of thermodynamics if you just ignore the part which consumes energy by calling it a demon and handwaving how it would work. What’s the use of that? This calls for one of those LED trick hacks, where you connect just one wire from a 9 Volt battery to the LED and leave the other leg hanging in the air, and the LED still lights up. Trick being that you sneak an enameled magnet wire inside the sheath of a multi-strand wire and run the return current through that. But don’t you have to alter the interior of the 9 volt battery to have the magnet wire connecting to the other terminal? No, just the button connector. Then you can pull the trick by cutting the black wire and showing that the LED keeps shining. Why no clock speed specified? Pffff, prior art called radio, IR communication. Look Ma, no wire! I’m assuming the 0-wire technology uses an in-phase beam to transfer the data across the quantum tunnel to the unicorn horn. The power is provided by a negative phase feedback when entangled quantum bits spin in the same direction. Or… you can just call it radio. This is a great idea, but I think the new cpu’s may be a bit I/O limited. These technology races just never end well. In the 60’s with the cold war, I recall the soviets trying to one up the americans by taking matell’s so called “close and play” technology and applying it to television. This is obviously a joke but it reminds me of something – there was a (legit) proposal to use the gap between the copper conductors of a normal telephone wire as a waveguide for terabit internet connections. See https://www.assia-inc.com/wp-content/uploads/2017/05/TDSL-presentation.pdf and note that it was in May, not April. Considering that 25 years ago, the idea of sending 600Mbps over a telephone line with just $20 worth of hacked Homeplug adapters would be considered so ridiculously silly, the idea that someone would eventually figure out how to send a few Tbps over a telephone line shouldn’t be dismissed right away. This is possible, but it has no purpose. So, not a good Aprils fool. I know its a joke, but Dallas 1-Wire indeed only needs a data and ground connection, and has an internal capacitance to remain powered while data is active. That is to say the data and power pin are the same pin. There is a power pin as well, but it is not required for operation. I recall that and thought it was clever. Never actually messed with it though. Little known fact: the original name of the tech was “One wire for carrying both signal and power, and the other wire for ground.” They just shortened it. This is why you can’t let engineers name products. It wouldn’t even fit on the box! Is it available in a BGA package? or would that just be a B package? No, it’s still a BGA, just a 1×1 grid. I hear these work very well with the 1 bit (as in containing exactly one bit) Write-Only Memory chips. i want to see chips with zero pins. they would be completely idiot proof. It was called Rococoaxial cable ???? I didn’t realize this post was a joke, and was actually quite unimpressed by the claims of the title before I read the whole post. Tesla wouldn’t need any wires.